It was ecstasy and agony for Manchester's two famous football clubs this week, with a Manchester United victorious in the Netherlands, but Manchester City humiliated at home. United beat Feyenoord 3-1 on Wednesday night, and the 3000 MUFC fans were well-behaved almost to a man - only one was arrested. The Dutch fans behaved "like animals" according to one Manchester fan. The final arrest score was 18 - 1 to the Dutch. Meanwhile, Manchester City plumbed the depths of despair after losing 1 - 0 to bottom-of-the-1st-division Huddersfield, the team they beat 10-1 exactly ten years ago. Fans gathered in protest outside the ground on Saturday saying: "It's the worst side I've seen for twenty years". I would like to introduce a parallel "Manchester Sports Newsletter" compiled by someone qualified to write about sport. If you know of anyone who could do this, let me know. Beleaguered ex-Tatton MP, Neil Hamilton pleaded his innocence in the Commons this week of accepting cash for questions. Unfortunately for him, the committee once again decided against him, but failed to prove conclusively that he was guilty of the "cash-for-questions" charge. They said his behaviour "fell well below" the standards expected of an MP, whatever than means. Mr Hamilton, whose career has been ruined by the accusations, was extremely dissatisfied at the inconclusiveness of the outcome, and will be having private talks with his erstwhile opponent Martin Bell, now the MP for Tatton. A 24 hour cinema is to open in Bolton. Owners of the Warner Village Cinemas, currently under construction, hve successfully applied for a licence to operate all round the clock. The complex is situted at the Middlebrook Leisure Park, and there will also be a MacDonalds, Kentucky Fried Chicken, and aa Pizza Hut as well as a bowling alley and themed bars. As the supporters of Louise Woodward in her home village of Elton held a day of action on Saturday, with bonfire and firework display on Saturday night. The case continues to arouse strong feelings here. Friday's edition of BBC1 televisions' Northwest Tonight briefly featured an intriguing photograph of a badly injured and bandaged baby. The photograph was said to have been released by the Eappen's to order to swing public opinion on their side. I have heard nothing about this photo from any other news source. Can anyone out there shed some light? Next week, WRKO Boston will present their morning radio show from Manchester, using facilities provided by the BBC. Your Eyewitness has been invited to take part in the programme. Executive producer Peter Skrypka told me they want to gauge the local reaction to Judge Zobel's decision. Royal Marine Santas abseiled down the side of the Arndale tower on Thursday night, and let off a confetti "bomb" as a peaceful response to the IRA bomb. It was all in aid of launching Manchester's Christmas celebrations. The city council are advertising the shopping attractions in the heart of Manchester on billboards using a Tellytubby with an "aerial" in the shape of a heart. 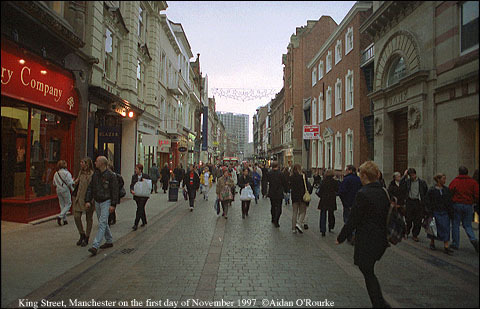 The volume of shoppers on the streets has grown noticeably in the last couple of weeks. The Central Library may not be the first place you'd think of to spend an all-nighter, but to celebrate National Library Week, the building remained open from 5pm to 8am the next morning. The weather has been mostly overcast, but mild this week, with temperatures in the 50's fahrenheit, around 11 or 12 degrees celsius. An area of low pressure has been covering the whole country, causing the unsettled weather. Wednesday A Virgin A340 plane makes an emergency landing at Heathrow after an undercarriage failure. Thursday/Friday: In a by-Election, Labour retain the Paisley south parliamentary seat, but with a reduced majority. The truckers strike which has been causing havoc in Fraance all week ends on Saturday. Saturday: Earl Spencer condemns the tabloid press as "despicable" and "evil".